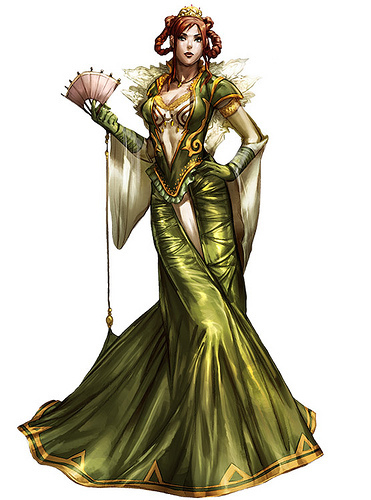 ''It's last season's style, but you make it work, dear"
Vonda was an advanced pupil at The Kandayan War College of Elemental Fire when Marik arrived as a teaching assistant. She is the only child of Count Westing and is spoiled enough to prove it. On hearing that Tristin Laaw, the son of the Duke of Laaw, was arriving, she put forth maximum effort to land herself a favorable marriage. Her hard work paid off when the King of Aquataine granted Tristin the right to marry her as a reward for his heroic part in saving the Prince at Winter Court. Vonda is jealous, spiteful and spoiled; the perfect noblewoman. She is also a, not inconsiderable, Sorceress in her own right.